The Majestic Theatre is a historic, volunteer-based movie theater located in downtown Lexington, Nebraska. Remodeled and reopened in June of 2015, the theater features second-run movies at discount prices. The new Majestic Theatre features a single 11 x 20 foot screen, digital projection and Dolby sound. Enjoy a soda and popcorn from our concession stand in the comfortable rocker seats with cup holders and generous leg room. The theater is handicap accessible and wheelchair seating is available. The Majestic Theatre is owned by Lexington Public Schools. The theater was purchased by the school board in 2012 to provide students with a hands-on, real-life learning opportunity. 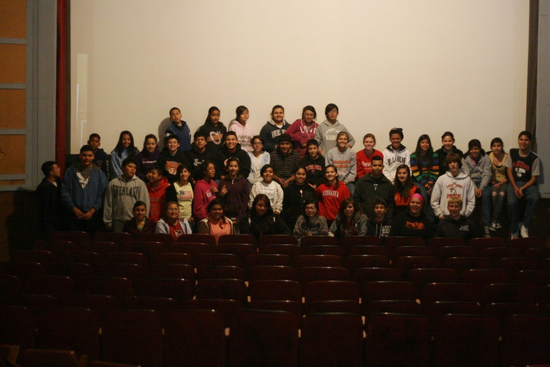 Students from middle school to high school were actively involved in the demolition and remodeling of the theater interior. The cost of the remodel was funded by both grant funds and private donations. Today, students are engaged in the ongoing operations of the theater; designing pre-show advertisements, assisting with the back-office business operations, taking tickets and selling concessions. The Majestic Theatre in Lexington, Nebraska was first opened in 1915. The Falkinburg family owned and operated the theater from it's inception until the doors closed in 2009. In February 2012, the Lexington Public Schools Board of Education agreed to purchase the Majestic upon the urging of then 8th grade students. The students, part of the graduating class of 2015, were challenged by the National Network for Educational Renewal (NNER) to come up with ideas to help the community. The students determined reopening the Majestic Theatre would have the greatest impact on the community and set out on their mission to reopen the Majestic by 2015, it's 100 year anniversary! The NNER group is still an integral part of the operations of the Majestic. The group is dedicated to continued community service and volunteerism in and around Lexington. For more information on the Lexington NNER group, please click here to visit their website.